There is no other experience on this earth quite like the Hacienda Na Xamena’s custom-created Cascadas Suspendidas. A bubbling, relaxing circuit of eight heated saltwater pools, with varying massage jets underwater and power showers from above, it is a spa experience immersed within the spectacular surrounding environment. 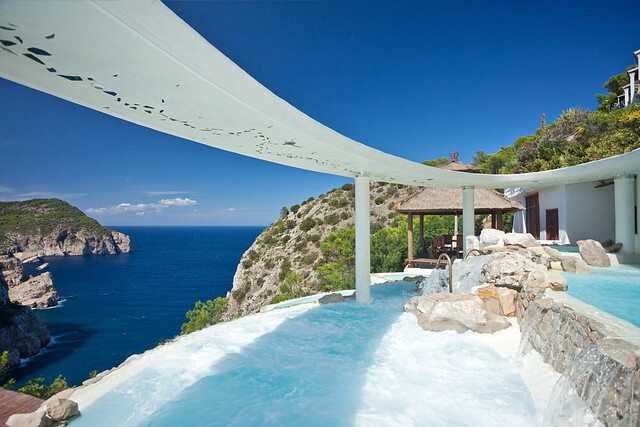 Pair this unforgettable Ibiza experience with your choice of snack, lunch or dinner to truly delight all your senses. Built into a striking cliff face, boasting panoramic views across the Mediterranean Sea, you feel as though you are suspended between heaven and earth, with the healing power of water working to soothe your body, mind and soul simultaneously – magical moments you will never forget.